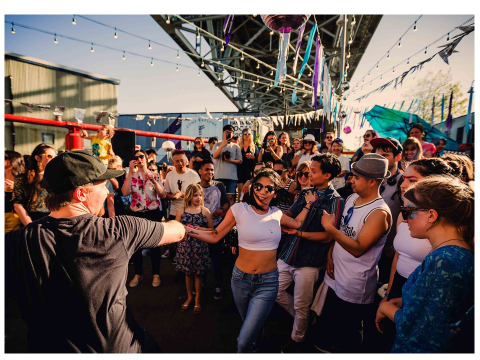 In spring 2018, the Chain & Forge public space was initiated as a pilot project to respond to the Granville Island 2040 strategies of Embracing Arts & Innovation and Restoring & Sustaining the Public Realm. Named after the Canada Chain & Forge Factory that operated on the site during Granville Island’s industrial era, it was designed as a versatile programming space that could accommodate a large crowd but also function as a passive space for relaxing, meeting and eating. 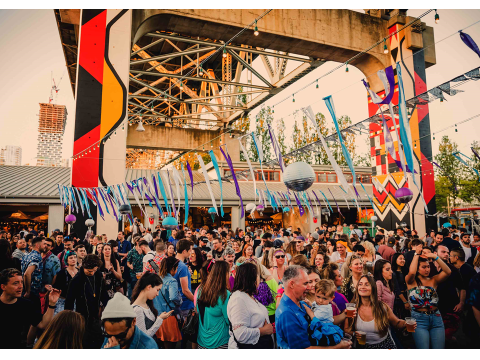 To launch the Chain & Forge, Granville Island worked with the team from Vancouver Mural Festival to create Art Smash, a celebration of visual art in public spaces. For its inaugural year, ten artists created murals that transformed the space into a vibrant outdoor art gallery. Located in the centre of Granville Island, these large-scale art works are free and accessible for everyone to view and enjoy. 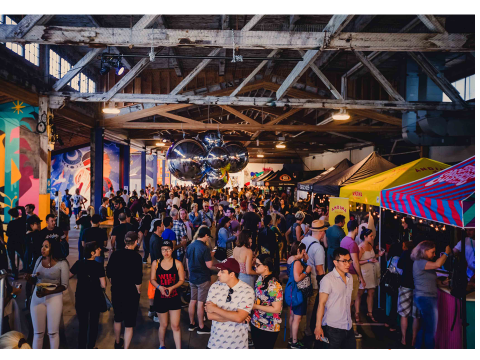 On May 12th, Granville Island hosted a street party with live mural creation, music by local DJ artists, local craft breweries, food trucks, and performances by the Vancouver Street Dance Festival community. More than 6,000 visitors joined in the festivities. Throughout the summer, a new Activation Grant Program was created to invite and support producers to program events and activities in the Chain and Forge. Successful applications were chosen based on accessibility: inspiring participation and engaging people of various ages, abilities, cultural backgrounds and economic status; innovation, creative collaborations, and capacity. Fourteen groups were selected, offering dance, music, yoga, educational activities and art installations for a total of 46 days of programming between June and September.